Katsushika Hachimangu Shirine is the guardian god of Shimousa province found at the Emperor Uta's behest in Heian period. 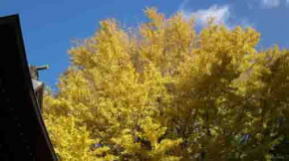 It was beloved poeple in Ichikawa city and is called 'Yawata no Hachimansama'. The first shogun of Kamakura Bakufu, Yoritomo Minamoto and the hero for samurais in Kanto, Masakado Taira visited and prayed there. It is a few minute walk from both Motoyawata Station and Keisei Yawata Station. On the rout 14 Chiba Kaido road to the city hall, the first Torii gate of Katsushika Hachimangu Shrine standing on the north, then there are many gingko trees, the second Torii gate, Zuishinmon gate and the main gate are along the aproach to the main hall called Shaden, and the trees turned splashing yellow in fall. 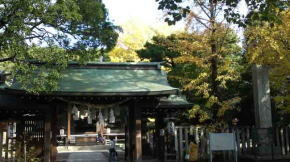 There are some properties in the shrine, 'Senbon Icho ( a gingko tree having thousands trunks) is designated as the national natural treasure, 'Bonsho (the bell) is designated as the prefectural cultural property, Zuishinmon (the gate enshrines guardian gods called zuishin on the left and right) is designated as the municipal cultural property, Kaguraden ( the hall for Kagura), the stone Yoritomo Minamoto's horse held on, Yawata no Yabushirazu, a stone tablet scribing a haiku poem by Issa Kobayashi and so forth are standing, so Katsushika Hachimangu Shrine has been loved by some writers as Kyoshi Takahama, Sachio Ito, Kafu Nagai, Rohan Koda and so on . 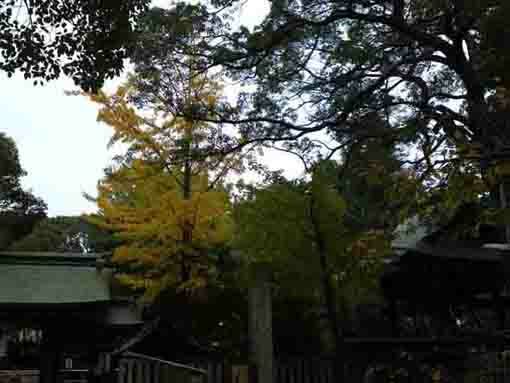 Anyway, the very popular woods in Japan called Yawata no Yabushirazu, the stone Yoritomo's horse held on and Senbon Icho Gingko Trees were counted as the three mysterious spots in Yawata no Hachimansama. 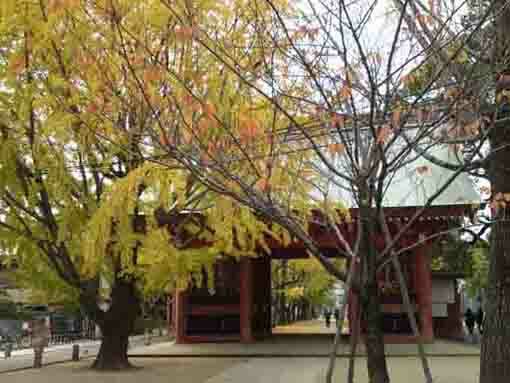 Why don't you visit Katsushika Hachimangu Shrine? * Some pictures on this page are taken before the renovation. 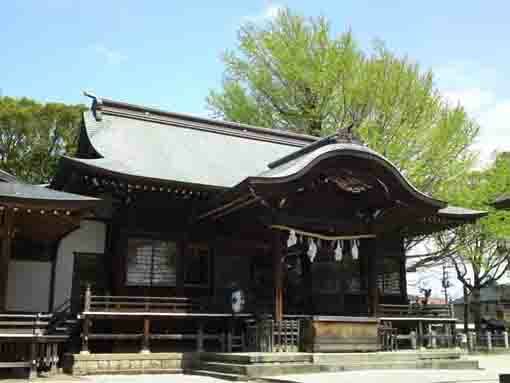 Katsushika Hachiangu Shrine that the area name Yawata was named after was a noted shirine built in Heian Period. 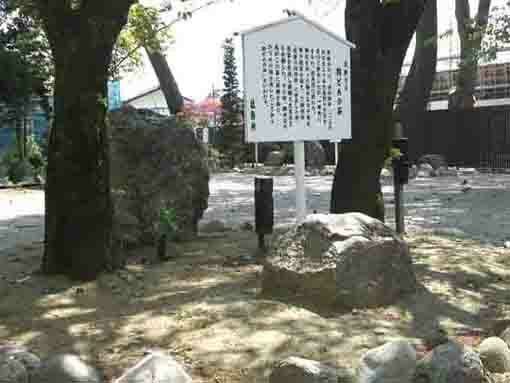 Now it is loved and called 'Yawata no Hachimansama' in Ichiakwa city. 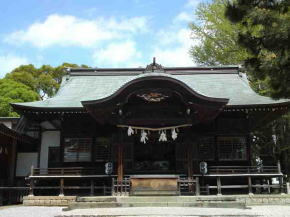 Katsushika Hachimangu Shrine was built at the order of the Emperor Uta during Kanpyo era (889-898). The Emperor called on the diety of Iwashimizu Hachimangu Shrine to make a branch shrine as the guardian deity of Shimousa Province. 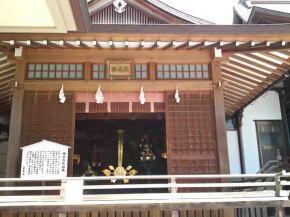 The enshrined dieties of Katsushika Hachimangu Shrine are Homudawake no Mikoto (the Emperor Oujin), Okinagatarashihime no Mikoto (the Emperess Jingu) and Tamayorihime no Mikoto. This Hachimangu shrine has been widely and faithfully worshipped by successive governors, local officers and people living around and it became the cultural center of Katsushika in Shimousa and the center of belief in Hachiman. Especially Kanto Bushi (samurai worriers living in Kanto region) worshipped to be the god of war. Masakado Taira made an offer to it. Yoritomo Minamoto visited it to pray for his good fortune in battle when he came to provincial capital of Shimousa from Awa province in 1180 and he commanded Tanetsune Chiba to renovate tha Shaden (main building) during Kenkyu era (1190-1199). And Dokan Ota visited to pray for security in Kanto region and renovated the Shaden when he built Konodai Castle to attack to Takatane Chiba in Usui Castle in the early Sengoku period in 1479. Moreover, Ieyasu Tokugawa believed it so he gave Shuin (his license) to keep 52 koku wide territory to the shrine in 1591 in Momoyama Period. 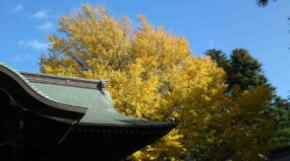 Moreover, there are other sceneries in Katsushika Hachimangu Shrine.The large gingko tree standing east side of the main building is called 'Senbon Icho (a gingko tree with thousands of trunks)' that is designated as the national natural treasure. 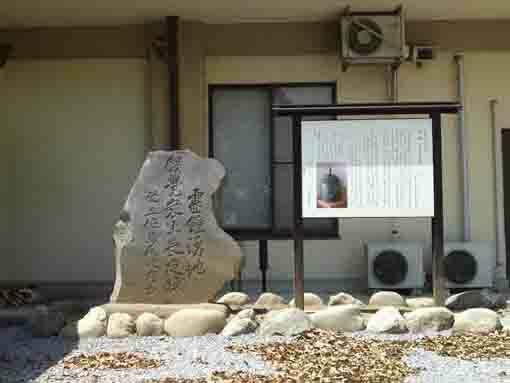 And the bell found in 1793 having the letters 'Genko Gannen (1321) on its surface is designated as the prefectural cultural property and it also tells how old this shrine was built. Katsushika Hachimangu Shrine holds its annual festival for six days from September 15th. The festival is called 'Yawata no Boroichi (the flea market at Yawata) and is famous farm implements fair among villages near it, so it had been the best market in Kanto region once upon time. Hatsu U Matsuri held in February is the unique ceremony that Yutateshinji, Yutatekagura and Gujimai are performed. 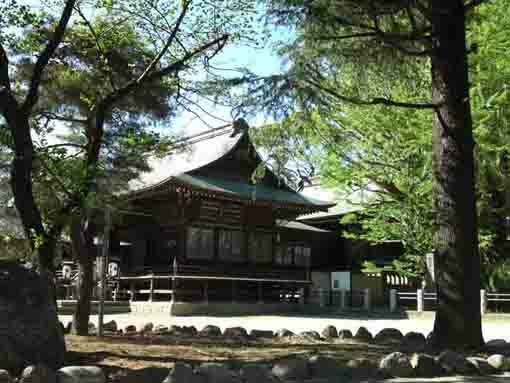 The shaden now existing rebuilt in 1913 and it has been renovated at Shikinen Taisai (the grand festival) held in every 33 years in April 1919, 11951 and 1984. Katsushika Hachimangu Shrine is the god of study, industrial promotion, agriculture, fishing, bringing good fortune, warding off evil, childbirth, children and match making. 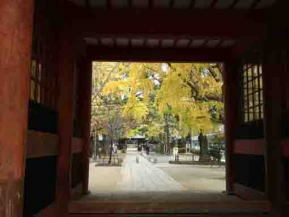 The treasures of Katsushika Hacimangu Shrine are the national natural treasure of Senbon Icho Tree, 'Yawata no Yabushirazu' (bamboo woods in Yawata) designated as preserving woods by the National Government, the prefectural cultural property 'Genko no Bonsho' and the municipal cultural property 'Zuishinmon Gate'. The annual grand festival is of course held in September 15th, and also the farming tool markets is opening by September 20th. 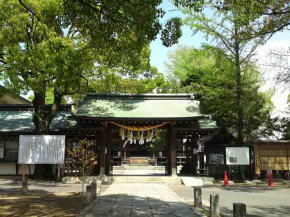 Katsushika Hachimangu Shrine has great accessibilities from both Narita and Haneda International Airport. From Narita International Airport, take Keisei-line and get off Keisei Yawata Sta, take minimally 45 minutes from Narita Airport. And also take JR Sobu-express line, transfer the line at Funabashi to Keisei-line, get off Keisei Yawata Sta. From Haneda International Airport, take Keikyu-line bound to Narita, and get off Keisei Yawata Sta. 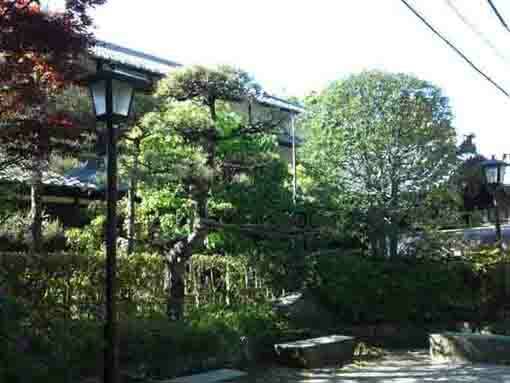 Take 5 minute walk from Keisei Yawata Sta.